Acting Australian High Commissioner Ms. Sonya Koppe presenting gifts to a winner. 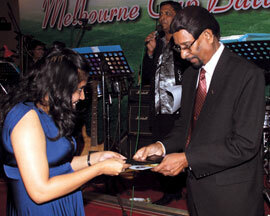 United Tractors and Equipment (Pvt) Ltd.(UTE) and the Sri Lanka - Australia - New Zealand (SLANZA) friendship association sponsored the 'Melbourne Cup Ball 2011' recently to raise funds for the National Cancer Institute - Maharagama. The event took place at the Ceylon Continental Hotel with the participation of a large gathering of SLANZA members and well-wishers. The contributions of the event will be channelled to the National Cancer Institute (NCI) to upgrade its infrastructure, purchase treatment equipment and medicine and for its general upkeep. The NCI is the largest Hospital in Sri Lanka, which offers specialised treatment for all types of Cancer patients. It helps to identify cancers in about 10,000 new patients, and does follow-up treatment for nearly 30,000 patients every year. Apart from the annual Melbourne Cup Ball sponsorship, UTE is closely linked with the other social wealth generation programs initiated by SLANZA as part of UTE's social responsibility initiatives. One such initiative was the construction of the Dialysis Unit in the Anuradhapura National Hospital to treat the large number of kidney patients found in the North Central Province. 'Melbourne Cup Day' is the most prominent equestrian festival in Australia and takes place annually during the first week of November.